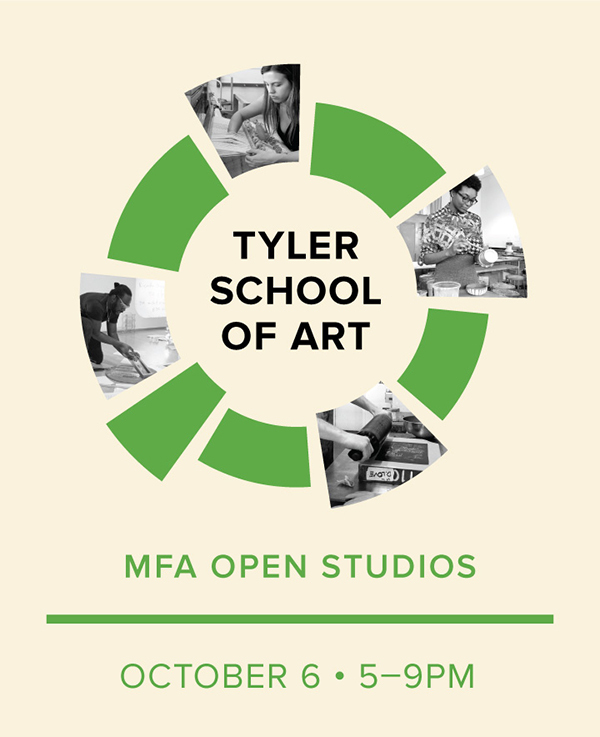 Tyler's MFA studios will be open to the public Friday, October 6th from 5-9pm! 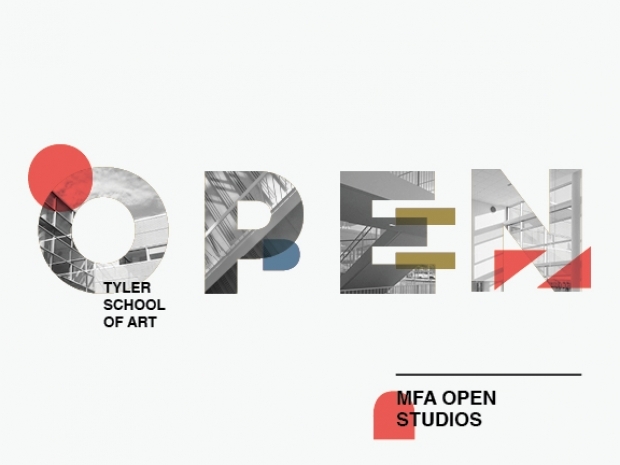 Get a behind-the-scenes look at graduate student work and meet students from Tyler's MFA Programs: Ceramics, Fibers & Material Studies, Glass, Graphic & Interactive Design, Metals / Jewelry / CAD-CAM, Painting & Drawing, Photography, Printmaking, and Sculpture. Please join us for a group exhibition of the Tyler School of Art 2016 MFA Graduates. This exhibition features works completed over the past two years from twenty-four artists in Tyler School of Art's nine MFA programs: Ceramics, Fibers and Material Studies, Glass, Graphic and Interactive Design, Metals/Jewelry/CAD-CAM, Painting, Photography, Printmaking, and Sculpture. 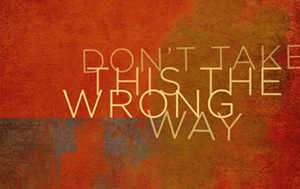 Don’t Take This the Wrong Way showcases the diversity of our backgrounds, media, and artistic processes, but also highlights the discourses and connections forged through two years of intensive studio practice in close proximity. The exhibition is accompanied by a catalog, which is the culmination of a collaborative effort between graduate students in the Art History department and MFA students. The catalog features images from each MFA Graduate accompanied by a critical text from an Art Historian. Don’t Take This the Wrong Way will be on view in the Icebox Project Space at Crane Arts from May 18-28, 2016 with an opening reception on Friday May 20 from 6:00-8:30pm and a closing party on Friday May 27 from 6:00-8:30pm. Friday, November 13, 2015 from 4-8pm. Featuring the work of 52 artists from nine departments. Jennifer Johnson makes work about power: what it looks like and how it functions. Made up of repetitive ceramics elements arranged geometrically, her sculpture creates environments involving screens, video projections and cultural remnants. In a general, but persistent sense it forms a critique of capitalism by addressing issues of gender, aging, class, race, and community. Natalie Kuenzi is a sculptural ceramicist and first-year MFA candidate at Tyler School of Art, receiving her BFA in ceramics from Western State Colorado University in Gunnison, Colorado. Her work focuses on the layering and interconnection of people, places, and perceptions, the fusion of seemingly opposing ideas, and an underlying sense of geometry and order amidst organic, fleeting materials and notions. Ashley York’s current work addresses the multiple vantage points in which we experience nature. A longing to interact directly with natural environments is expressed as a haiku response through objects that are reminiscent and symbolic of specific places or characteristics of the landscape’s architecture. She is not replicating the landscape itself but trying to understand and communicate the varying degrees of mediation that exists between people and nature. Daniel Zentmeyer believes in the studio as a site for excavation of identities, histories, passions, collective consciousness, etc. Through the “labor” of art-making one arrives at both a stage and a staging of something that is outside of the prescriptive and resolved narrative of the everyday. Angela Drakeford’s work addresses racial identity and the myth of a post-racial America, particularly moments in which her own identity is called to question or made a focal point in passing conversation. When these encounters occur, Drakeford reflects on the experience of being a minority within a minority, making work that reflects how it feels to exist in the middle of something, the liminal space created between a person’s assumptions and the known reality. Enrica Ferrero works with textiles and digital imaging. She is currently focused on a project about about Urban spaces, Fantasy, and Marxism. Ajay Leister is a second year MFA candidate in the Fibers and Material Studies program. He received his Bachelor of Fine Art in Fiber and Master of Art in Teaching from the Maryland Institute College of Art. In his current studio practice, Ajay creates molds out of stitched plastic drop clothes that he fills with cement to make forms that allude to the body. Yixuan Pan: Color and light, poetry, found objects, time-based movement, Thomas Edison, the moon, epistemology, or conspiracy theory… these various elements hypnotize Pan to seek the veiled network in the amorphous cosmos. She is attracted to the relationship between Subject and Object and how we from various cultures/environments/contexts see ourselves differently. Her art is a metaphysical experience and experiment—static yet changing, private but empathic—beneath the physical pieces is a latent sociological and psychological structure. Ian Schmidt: Observation of space, time, and moments of contemplation are present in the work of artist Ian Schmidt. As a craftsman it is an integrity to the process he takes into every piece and project. With his use of glass the intention is to explore a space as a means of transformation. MFA Candidate Glass. Katie Steinberg is currently building miniature houses and photographing them in familiar, yet, surreal environments. Miniatures function as fantasy structures, simultaneously enabling and obstructing access. The resulting transformation alludes to isolation, arrested time, and the duality that plagues the structures. Kristen Neville Taylor uses objects, images, and glass to examine the social and political systems that shape individual mythologies over time. She employs both personal and cultural access points to analyze the underlying structures of collective memory. Taylor’s strategy is in connecting historic events and ephemera with the present to make visible culturally constructed paradigms and to understand where productivity might lie in nostalgia. Krissy Beck is a Philadelphia based designer with a background as a freelancer, production artist, and sign maker. She aims to create work with a strong focus on research and history through which a viewer will learn and appreciate cultures and experiences different from their own. Courtney Brown is an artist & designer living in Philadelphia, PA. She received her BFA in from the University of the Arts in 2011, majoring in Printmaking and minoring in Multimedia Design. Courtney entered the Graphic & Interactive Design program at Tyler School of Art in 2014 and will graduate in May of 2016. Ryan Hewlett came to Tyler because of their Focus on authorship. Hewlett was ready to create projects that had no client direction or other type of outside concerns. Really, it was about getting back something that we often lose along the way — our innate ability to create, discover, and play. Katie Savage is a Philadelphia-based graphic designer. Her work is heavily researched and varies in execution and media to suit the content: from wooden puzzles and patterned plates, to illustrated children’s books and large-scale exhibition graphics. Laura Sutphen is an enthusiast for the interplay between voice and story-telling through graphic design. With a growing interest in how mixed media can be used to emotionally explore narratives, she likes to make things that elicit feelings and associations grounded in her own personal experiences and other's. Her work embraces a wide variety of materials drawing from a love of hoarding street pamphlets, visual anthropology, photography, and constant doodling. Karen Watkins: With considerable experience in museum and exhibit design as well as brand and identity development, Karen specializes in providing dynamic print and media solutions for non-profit entities. At Tyler, Karen is enjoying the opportunity to explore other mediums and fabrication techniques outside the realm of traditional printing methods and applications. Her graduate seminar and thesis projects are expressed in layers of personal experiences. Bryan Kekst Brown is currently working on a body of wearable works that intend to bridge the gap between matter, time, and consciousness. Objects become snapshots of processes initiated by and existing on the wearer. Each piece displays a moment of an ongoing or cyclical process. Visual references such as apparatus, specimen, and physics function to define our existence within what can be referred to as space-time. Ryu-Hee Kim finds deep interest in Korean culture’s mythology and memories of life and death, past, present, and future. The highly polished surfaces in her work evoke the physical act of Korean ceremonial rituals and embody a reverence for my ancestors. The topographical layers in her pieces emulate the time span of human history. Through Kim's pieces, the viewer can find hidden messages: reverence, relationship between man and nature, and the time span of the past-present-future. Sara Gallo and Barbara Baur will not be showing work at Open Studios, as they will be at the Philadelphia Museum of Art Contemporary Craft Show showing their work that afternoon. Stop by the Craft Show November 12 - 15 to see work by Tyler students from the crafts disciplines. Matt Coombs makes paintings, collages, and drawings that formalize his obsession with American landscape painting, safety, and pride. Coombs views the raw canvas of his paintings as a large sketchbook page, as much of a place for planning and thinking as it is for plundering and indulgence. Taking inspiration from writers like Alfred Jarry, as well as imagery from American popular-culture, Coombs' current work challenges the lingering notion of the Romantic Landscape. Corinna Cowles’ work is an investigation of the relationships between color and pattern, domestic architecture and the body, and text and textile. The combination of fabric, pattern, and found objects allow for an exploration of an anxious mental dialogue, interior spaces, and what it means to be living as a young lady in a country obsessed with power and consumption. Inspired by clothing and decorative patterns, the work exists as painting and sculpture, humorously revealing and concealing information from the viewer. Bryant Girsch’s artwork addresses questions of kitsch and sincerity by examining this relationship through both a historical and contemporary lens. Interweaving decorative subjects from 19th century European salons alongside their middleclass, department store contemporaries suggest the navigation of both past and present simultaneously. His paintings explore this psychological space in an attempt to reevaluate an ever fluctuating identity. Natasha Gusta: Lately Natasha’s interests have been growing more anchored to the act of looking, most specifically at things that are made to look like people. What do we reveal through the drive to re-make ourselves into images and things that have no easily apparent usefulness? What of the drive to anthropomorphize that which no longer lives or never once lived at all? How might the grotesque inspire empathy, or acknowledge a shared condition of anxiety? Sarah Heyward's work investigates her battles with anxiety though stoic representations of her childhood domain. She approaches her drawings by focusing on the deliberate elimination of information. The reference image is deconstructed strategically, forcing her to control anxiety and the desire to clutter the compositions with visual chaos. The obliteration of information references memory and the human incapability to remember past realities. These cold, monochromatic, pieces have an x-ray like quality that challenge the viewer to problem solve the missing information. Molly Metz is a Philadelphia based artist b. 1992. Her work is about the American experience and the anxieties of societal expectations. Expectations such as the perfect house, the perfect car, wealth, and success. She spends a lot of time observing advertisements, and collecting various found images from low budget magazines such as auto shoppers and grocery circulars. These images are then rearranged and placed in a new painted space. The end product becomes obscure and vague and sometimes disturbing. Andrew Negrey wants to make paintings that feel like one of those dreams where you find an extra room in your house that you didn't know existed before. He approaches painting as a subspecies of the psychedelic experience, a chance to explore how the world is made and unmade in your head and and how inner and outer realities intersect and transform one another. Destiny Palmer: Interpret, engage, reminisce, critique my work. Access and question what has been presented, allow yourself to be a part of the painting. Dissect it until you have nothing but questions and self fulfilling answers. Allow yourself to find comfort in not knowing and maybe not understanding. Bianca Schreiber is a New York City based artist. She graduated from Barnard College, Columbia University (New York, NY) with a B.A. in French and Francophone studies in 2011. She is a Painting MFA candidate at Tyler School of Art, Temple University (Philadelphia, PA). She uses paint and composition in order to highlight the sinister story of a place and time that is revealed by its seemingly innocuous contemporary imagery. Stass Shpanin was born in 1990 Baku, USSR. During his BFA studies at the University of Hartford, Shpanin created monumental paintings combining different layers of European and Russian history. After graduating in 2012, Shpanin travelled to Russia on a U.S. Fulbright fellowship. His current work deals with American Civil War era. Shpanin exhibited his works Internationally and recently became a member of the Board of Trustees of the Hartford Art School, University of Hartford. Troy Holleman’s work is an attempt to challenge the viewer's perception of the human experience. The object to human relationship encourages the viewer to deconstruct the situations he places them in. This is done by breaking down the objects or images forms in relation to their symbolic and cultural meanings, creating simulacra of circumstances and simulations of environments for the viewer to inhabit. An action exists in every piece and sometimes the action is you. Kris Kelley is a Philadelphia-based artist. Drawing from her background in psychology and her experience as an assault survivor, her works are embedded with psychological elements and involve complex ideas about identity, the body, and the role of memory in how we experience our past and present. She focuses on photography, often augmented with sculpture and other mediums. Daniel Kraus’ work investigates the effect of time on photographs and the use of found imagery. All of his work is also inspired by spiritual themes, which emanate from his personal life. He holds a BA in History and a BFA in Photography from the University of North Florida and is currently a MFA, Photography, candidate at Tyler School of Art. Stephanie Lynn Rogers has a background in photography, site-specific installation, and community-based work. She is interested in the construction of identity and the relationship between human beings and other species. Current work-in-progress takes the form of photographic prints on fabric and garments. Patricia Swanson’s work deals with issues of violence against women. Using both a personal and historical context, she investigates how society has shaped ideas of femininity within the public and private sphere. Swanson questions and comments on how these ideas are created and perpetuated by societal constructs that conceal the realities of women’s position within a patriarchal society. Harrison Walker’s work looks at time and memory through the investigation of relationships of objects and images that reference the Industrial Revolution through WWII. He uses his own imagery in combination with found imagery and objects. He currently works with both print and book forms using charcoal, conte crayon, cyanotype, etching ink, gum bichromate, liquid light emulsion, lithographic ink, paper, pencil, pigments, silver nitrate, tannic acid, van dyke brown, and wax. Maya Malachowski Bajak is a Peruvian American artist and a second year MFA candidate in Printmaking at Tyler. Maya’s work explores concrete and its relationship to culture and the natural environment. Her drawings and prints reveal the tension between concrete’s earthbound origins and its crafted image as a denatured marker of progress. Rooted in the mundane architecture of parking garages and malls, Maya’s work examines the building and the eroding of ordinary constructions in the American landscape. Amy Cousins is an artist from Houston, Texas who works across media including printmaking, fabric, and sculpture. Her work explores the unspoken functions of domestic objects as reflections of how we see or want to see ourselves. Using upholstery as a metaphor for the masks we wear, she investigates queerness and normativity within the entanglements of identity, desire, and societal pressure. She creates surfaces that reveal instead of hide, demystifying the allure and sheen of normative home life. Qiaoyi Shi is a printmaker and illustrator interested in exploring digital art. Her latest series of prints incorporate laser cutting and engraving techniques from vector objects. The plates are digitally cut onto Plexiglass sheets, inked and printed using traditional etching methods as well as monoprinting techniques. The series consists of 100 small prints that reflect her current life, dreams and recollection. Teresa Cervantes is a second year sculpture graduate student working with a variety of approaches including performance, drawing, and found objects, among others. Of concern in her work is the hypothesizing of alternate forms of value, power structures, and roles of the artist in society. Playing with the perceived and physical boundaries of language and history, her recent interests include corporate trust/team building exercises, satire, appropriation and the figure. Filipe de Sousa uses a variety of strategies to explore infrastructures; both physical/digital and public/private. With an eye on the political forces which influence and transform experience within the Western world, de Sousa hopes to complicate the dominant narrative and offer alternative visions for the future. His current interests include the "platform economy", platform shoes and parking lots. Artist Statement: "I am not there yet." TJ Hunt is a second-year graduate student in Sculpture. Her practice centers around the themes of sustainability, autonomy, and artistic identity/agency, mining the problems and mythologies that tie these things together in their various conceptions. Drawing from an interest in landscape, land use, and the politics of the built environment, her recent sculptures play with shifts in scale to become simultaneously objects of contemplation, metaphorical spaces, and models or proposals for more expansive projects. María Leguízamo: Whereas a drawing, video, writing or object, the sculptural intention stands out since María Leguízamo’s main interest is 'action'. The verb that related to a material, originates any image. I have focused my practice on topics such as the phenomenon of absence of land and the power of fragility as subversive apparatus, always departing from personal experience and the need to understandwhat the existence is made of. Matthew Speedy is a first year MFA student in the sculpture program. His current area of interest and investigation is in the transmission of information that we are unaware of. These invisible conversations exist between our technology and ourselves and has led him to do research into telepathy, government black budget programs, and other science-fiction/conspiracy theory related stories. Kara Springer is a visual artist and industrial designer. Of Jamaican and Bajan heritage, Kara was born in Barbados and grew up in Southern Ontario. Her interdisciplinary practice explores the intersections of the body and industrial modes of production through sculpture, photography and designed objects. Michael Taylor: The work exists to provide the audience and viewer with opportunities to consider possibilities of truth outside their individual experiences. Paint, wood and paper stand on equal footing with poetry, performance and social interaction as mediums to create a catalyst for moments of altered reality.